SEOUL/WASHINGTON, May 11 (Yonhap) — The leaders of South Korea and the United States on Wednesday vowed to maintain close cooperation in handling North Korea’s nuclear threats in their first phone talks, Seoul’s presidential office said. President Moon Jae-in and U.S. counterpart Donald Trump also agreed to hold a meeting as early as possible to discuss North Korea and other pending issues. The liberal leader won a widely expected victory in Tuesday’s election triggered by the March 10 ouster of his scandal-hit predecessor, Park Geun-hye. He was sworn in earlier on Wednesday. Moon also called the Seoul-Washington alliance the “foundation” of South Korea’s diplomatic and security policy, while noting that Trump has put the North’s provocations and nuclear problem atop his security agenda. Trump expressed “respect” for South Koreans’ choice of Moon as the new president, and said that the North Korean conundrum, though challenging, can be resolved, the presidential office, Cheong Wa Dae, said in a press release. The U.S. leader, then, said that he would officially invite Moon to Washington. “President Trump and President Moon agreed to continue to strengthen the United States-Republic of Korea alliance and to deepen the enduring friendship between our two countries. President Trump said he looks forward to working with President Moon and invited him to visit Washington at an early date. President Moon accepted the invitation,” it said. Their talks came amid growing concerns that tensions could flare in the alliance due to the leaders’ differences over a set of security issues such as how to handle a provocative North Korea and the deployment of a U.S. anti-missile system to the peninsula. 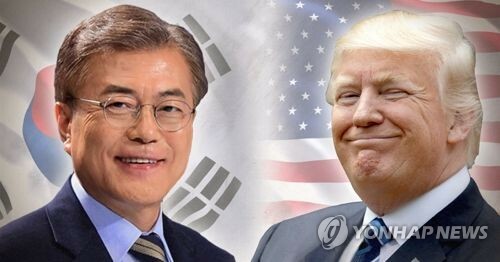 Moon seeks dialogue with the North, while Trump’s approach to the wayward regime focuses on “maximum pressure and engagement.” Moon has also called for a delay in the installation of a Terminal High-Altitude Area Defense battery here, citing the need to forge public consensus. He has demanded the decision should be subject to parliamentary approval.